Today we are broadening the horizons of Localscope further with v2.3, an update that highlights how location as a facet reveals relevant local information from conventional information systems. The Wikipedia source helps you find interesting and relevant information that matters to you. Wikipedia, the worlds largest encyclopedia, is a remarkable source of information on countless number of places written and maintained by volunteers from all over the world. Over 1.3 million pages are tagged with geo data. We mesh this data with your location and present to you a localized encyclopedia with relevant articles about places around you. If you thought there is not much to know about your area, try discovering it through the Wikipedia lens in Localscope, you will be pleasantly surprised to know of the cultural, historical and factual information about it that you were yet to uncover. 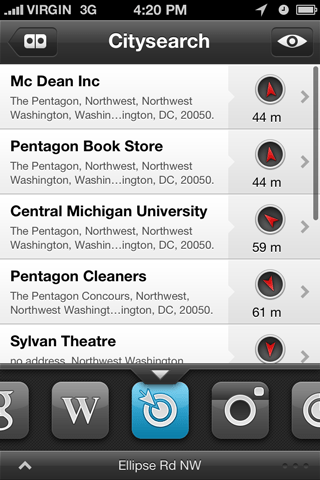 Citysearch is a popular online yellow pages service that covers more that 75,000 locations across the United States. Citysearch uses the database provided by Citygrid that lists local businesses, services, restaurants, hospitals and more. It also aggregates information from other online business listing websites. Besides the listings, Citysearch provides editorial recommendations along with local user comments and ratings for businesses in popular categories like restaurants, nightlife, hotels and services. 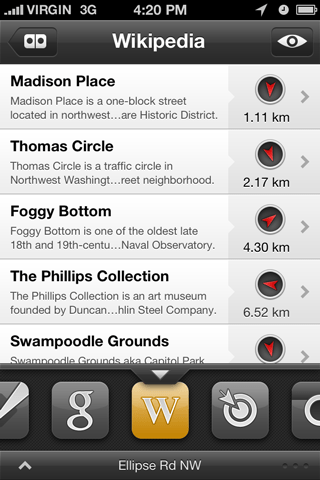 Integration with Citysearch gives Localscope users living or traveling to the United States another choice to find and discover new places around them. In v2.2, we powered Google results in Localscope with Google Places that provided better results with star ratings for places. While Google Places is a great source for reliable business listings for an area, users still craved for the bulk of location information that they were discovering from Google when powered with Google Local. 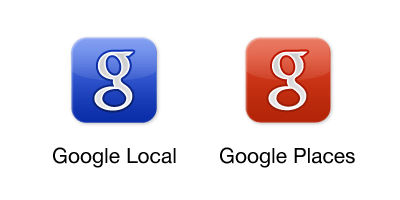 On popular demand, we are bringing back Google Local along with Google Places as 2 separate sources. Either of the sources can be independently enabled / disabled from the source manager screen. Lastly, we’ve added new pre defined search terms and icons and also updated the Facebook API integration that fixes some of the issues with searching from Facebook.